The Gold Coast is one of the best served areas for whale watching through our long official season from early June to early November each year. There are several operators on the Gold Coast and each of them have their pros and cons depending on who is in your party (ages and mobility), where you are staying and what experience you are looking for. If you are still at the planning stage for your holiday to the Gold Coast, there are a few tips and tricks to selecting the right combination of activities incuding whale watching to maximise your holiday dollars. I recommend my planning cheat sheets, tips & tools as a great resource, to step you through the process and make sure you don't miss anything! Whale watching tours on the Gold Coast. If you are looking for a quick reference and just want to do whale watching, then at the bottom of this page you will find a selection of Gold Coast whale watch cruise operators in a table where you can compare them side by side. Who has the biggest whale watching boat on Gold Coast? I'm staying in Broadbeach, which Whale Watch to choose? Will I get sea sick, and if I do what is the best option? 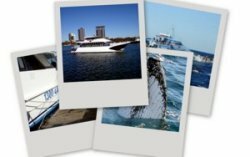 Best whale watching boats for seeing the whales up close? Who is the best value? Can I take my kids on board? 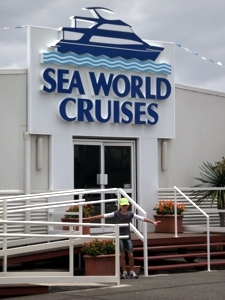 Which cruises have wheelchair access? So let's go through our favourite selections one by one. Sea World's Whale cruises are the most popular of the whale watching cruises on Gold Coast. Taking out upto 125 passengers daily in the morning & afternoon (June through to early November). May & November cruises generally are cheaper but don't have the whale sighting guarantee. This is a popular choice, most people have heard of Sea World and feel comfortable that this cruise will be good quality, reliable and have credible whale and marine commentary. And this is exactly what you get. In addition, their boat is a large cataman style for stability that has been custom built for whale watching. There's lots of technology on board to help you get a very full experience, along with their marine biologist staff. There's plenty of shelter inside if the weather is not so good or cold, and several viewing platforms. If you choose to drive yourself, there is free parking in the Sea World car park. For the morning cruise, you will usually have no problems with finding a spot. For the afternoon cruise, the car park is usually pretty full with all the Sea World theme park guests. Children under 3 years are not permitted on Sea World Whale Watching. They also have the ability to take wheelchair passengers, but you'll need to contact them directly regarding this option as they only have room for 2 wheelchairs per cruise. As with all whale watching I recommend scheduling your cruise early in your stay, just in case it has to be rescheduled due to poor weather. This cruise is ALWAYS POPULAR with a well respected cruise operator. Morning cruise goes every day during season. Lots of parking close by and easy to get to using shuttle buses, or public transport. This popular cruise is often fully booked, so it is worth booking ahead, especially during school holidays. 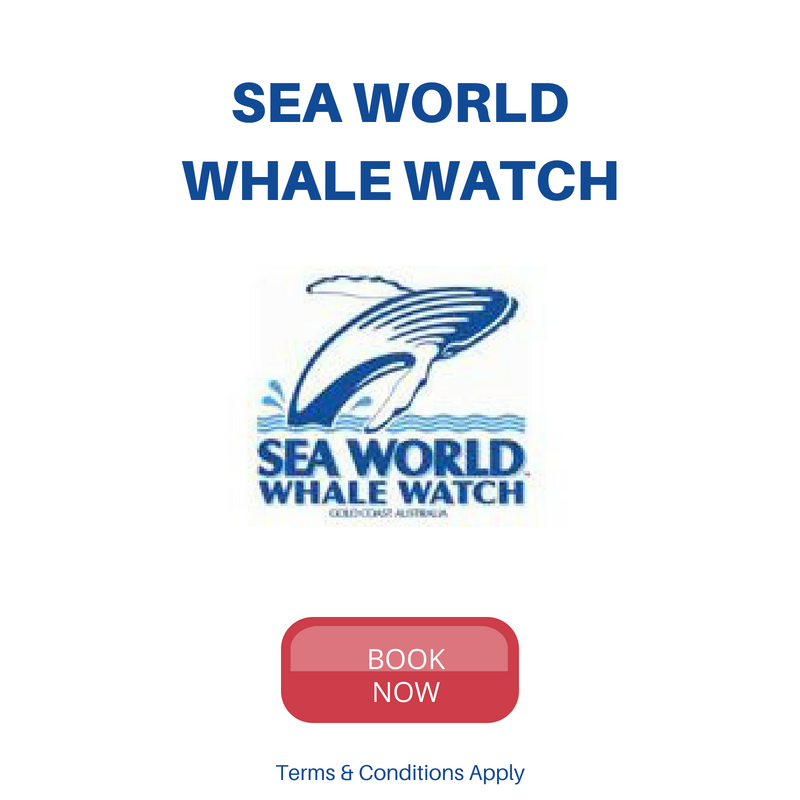 Sea World Whale Watch is a popular option, because it is easily recognisable, it has a large boat and is backed by the professionalism of Sea World. Sea World Whale Watch Cruises are available in the morning from 10am to 12.30pm and sometimes in the afternoon from 2pm to 4pm (though you will need to check for dates and availability on the links provided). You will need to arrange transfers to get to the Sea World Cruise Terminal - which is in the car park of Sea World. You can use the standard Sea World theme park transfer for the morning cruise. This season there are two cruises daily. The morning cruise departs around 10am returning around 12.30pm. The afternoon cruise (not always available) departs around 2pm returning around 4.30pm. All cruises are dependent upon weather conditions, which is why I always recommend you plan your itinerary for your holiday beforehand and book in your cruise early in the vacation, in case it has to be rescheduled. 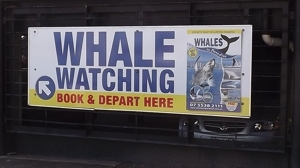 It would be terrible to miss out on seeing the whales. Outstanding Value - no credit card or booking fees. Print your own vouchers. Mobile Vouchers Accepted. This season there's a choice of 4 cruises per day running with their two catamarans. They are the only full size boat whale watch cruises departing from the heart of Surfers Paradise. This offers even more options for visitors, especially the morning options which allows you to do another activity afterward. If you are staying in the centre of Surfers it's best to walk to the jetty which is located behind Vibe Hotel near Appel Park. On the downside, there isn't any free parking here. If you need to drive and park there is parking under Circle on Cavill or Chevron Renaissance, which are both within about 100m of the wharf. Hotel transfers can be arranged at additional cost. There are several things I like about this cruise, over and above them being the only large boat cruises to depart from Surfers and five tours daily. You also get a bonus canal cruise to check out some of the rather nice houses (and I believe a few celebrity gossip moments too) along the canals as you head out to the Broadwater and then out to see the whales. This extra cruise time also gives you plenty of time for the seasickness tablets to kick in before you head out into the open water. And if you forget yours, they can sell you some on board. The other really good thing about this boat, is that although the boats are smaller than the Sea World and Tall Ships boats, they have the advantage of having water level viewing decks. The smaller of the two only takes a maximum of 65 people whilst Kaiala (commissioned in 2015) takes up to 120 passengers. The boats have been modified to maximise whale watching experience with a custom water level viewing deck and a walk around deck. If you feel that a smaller boat may not be as stable as a larger boat, you will find that these boats have a lower centre of gravity and so don't sway as much as the bigger boats. The family package is a nice saving, making this quite affordable for all the family to enjoy. This cruise is not recommended for Children under 3 years of age. 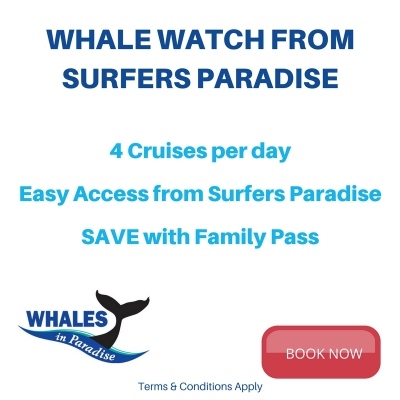 If you are staying in Broadbeach, Mermaid Beach or Carrara, this is probably your closest whale watching cruise option. Don't forget to plan your itinerary around doing you whale watching cruise early in your holiday in case it has to be rescheduled due to poor weather conditions. # Prices can change without notice, prices on tour desk are correct, click through links for all up to date details. These cruises go from the heart of Surfers Paradise, so you don't need transfers! Departs 4 times per day - morning, midday and afternoon. This is the only whale watching cruise that leaves from the centre of Surfers Paradise. 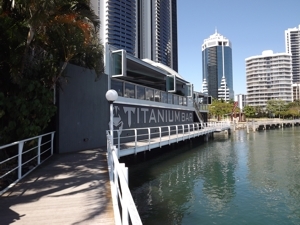 If you are staying in Surfers, Broadbeach, Main Beach or even Southport, you can either walk (Surfers Paradise only) or take the new G:Link or a bus to this cruise. No need to use an attraction transfer for this one! If you need to drive, you can easily park across the road, under Circle on Cavill or Chevron Renaissance. Parking charges will apply. There are a couple of great advantages for this whale watch including the convenience of the departure location, a bonus canal cruise to see the houses of the rich and famous from the Gold Coast before you head out to see the whales and the flexibility to choose one of 5 daily cruises to see the whales. Cruises are just over 3 hours and depart at 7.30am, 9am, 11am, 1pm and 2.30pm daily. You need to be checked in at least 20 minutes before departure. All cruises are dependent upon weather conditions, which is why I always recommend you plan your itinerary for your holiday beforehand. Book your cruise before you arrive in Gold Coast and make sure it is early in the vacation. This is in case it has to be rescheduled due to weather conditions - it would be terrible to miss out on seeing the whales. BE QUICK. Click for more info or BOOK NOW. Outstanding Value - no credit card or booking fees. Print your own or use mobile vouchers. # Prices and times are approximate and are subject to change. I try to keep it up to date but things change! Please note: boarding is generally 30 minutes prior to departure times. All of these Gold Coast whale watching tour operators offer some form of guarantee should they not see a whale during the tour. These are pretty much the same, but most have a very high whale spotting record.